Nature has bestowed Kashmir with extraordinary climatic conditions and forest cover, apt for different mushroom varieties including gucchi (Morchella), an exotic species of the mushroom family. Many describe it as the 'cuisine of the royal'. But the state hasn't put this mushroom to much use. People in Kashmir are not keen about gucchi. There could be two reasons for this. First, gucchi is so expensive that people mostly cannot afford it. Second, Kashmiris are known to prefer mutton and chicken. However, affluent families do go in for this 'vegetarian' food. It is prepared during functions. Mostly, wazas or Kashmiri chefs prepare gucchi dishes during marriage parties. These dishes are mostly served to the bridegroom and his friends during the reception ceremony at the bride's home. Thus the bride's family highlights its affluent status. Gucchi grows in the wilderness. Mostly it grows in forests located above 2000 meters from sea level. In Kashmir it is mostly found in the forest ranges of Anantnag, Kupwara and Kangan, all higher altitude places. In the Jammu region, gucchi are found in the Doda and Kashtiwar forest ranges. It blossoms in springs when the climate is pleasant, neither too hot nor too cold. It will always be found under deodar and pine trees. Gucchi collection is a very cumbersome task. Collectors have to trek hundreds of miles through forests to identify and then collect the exotic mushroom. Collection also consumes a lot of energy and takes time because there are hundreds of varieties of wild mushrooms in the forests; identifying gucchi among them is a very difficult. A persistent myth associated with gucchi collection is that only a person with a dark complexion can recognise the real thing and pluck it out of the dark forest floor. "This is a myth and there is no such thing associated with gucchi plucking. It is very difficult to recognize the gucchi when hundreds of species of mushroom family are found in the woods. But the common belief of people that those who have black complexion can identify the gucchi is wrong scientifically," explains A R Wadoo, chief conservator of forests, Kashmir. A kilogram of Kashmiri gucchi sells at Rs 4000. The state government earns royalty on leasing out the forest ranges to contractors for collecting gucchis. In 2001, the Jammu and Kashmir forest department earned Rs 2.77 lakh in such royalties. In 2002, it earned Rs 3.41 lakh. The gucchi economy is entirely private. Most of the gucchi collected is sold outside the state. A state rich in a resource is unable to use it -- or doesn't -- for its own economic well-being. Amazingly, no researcher has been able to develop spores of Morchella so that this species can be artificially cultivated. "There are certain things that nature has kept secret and confided to itself. In my personal opinion, if anybody can develop the spores of the Morchella family which can enable people to artificially grow Gucchi, s/he is worth for a noble prize," says A S Shawl, head of the Regional Research Laboratory (rrl) Kashmir, a unit of the Central Science and Industrial Research. Several researches were conducted to unveil the mysteries of the Morchella family, but either they bombed or failed at one stage or the other. In 1982, noted researcher Ronald Ower tried to develop the process by which the Morchella grew, but failed. The agriculture department of Kashmir tried to grow gucchi on a demarcated land at Gulmarg forest range, but the attempt came a cropper. "As it is impossible to grow gucchi in controlled condition, we decided to give a try and sow the mycelium in the forest ranges. We demarcated a stretch of land and sowed the seeds on a scientific pattern. We were relying on the natural conditions and habitat. But it did not yield any results", says Bashir Ahmad, mushroom specialist in the department of agriculture, Kashmir. Gucchi has tremendous medicinal value. It can be used to treat several fungal infections and tumors. " Gucchi can be used as tonic for intestines and stomach. It is also known as the elixir of life. For instance, Morchella hotenis can act as an antiviral and could treat various virus related diseases", notes Shawl. According to Mohammed Yousuf, officer in charge of the Regional Research Institute of Unani Medicine, the mushrooms -- particularly gucchi -- are very helpful in adding vitality in weak patients. "In the Unani system, some fungi including the gucchi are used as vitaliser. We generally use it as a vitaliser for patients who have a deficiency of proteins," he adds. Not only the gucchi, but other varieties of mushrooms -- both found in the wild and grown artificially -- have a tremendous medicinal value. Paul Stamets in his paper 'Novel Antimicrobials from Mushrooms' notes that few medical practitioners are aware that many of the externalised secondary metabolites -- extra-cellular secretions by the mycelium -- combat bacteria and viruses. Additionally, he says, the exudates from mushroom mycelia are active against protozoa such as the parasite that causes malaria -- Plasmodium falciparum --and other microorganisms. Accordingly, Stamets writes that with an increasing number of bacteria developing resistance to commercial antibiotics, extracts from mushroom hold great promise for novel medicines in modern times. "The hypothesis, increasingly substantiated, is that mushrooms especially polypores, provide a protective immunological shield against a variety of infectious diseases", he adds. rrl, Srinagar, has listed some of the mushrooms that have different medical value. In a paper 'Medical Effects of Different Species of Mushrooms', the rrl has listed 27 mushroom species that have medicinal value and can be used for treatment of various diseases. According to the paper, some species can be beneficial to patients suffering from different sort of tumors. For instance, the Falmamulina Velutipes species of mushroom has anti-tumor, antibacterial and antiviral properties. Similarly, Armillalria caligata, Boletus edulis and Calavaties gigantea have anti-tumor and anti-viral properties. Lentinus lepideus is an anti-tumor species while Omphalotus olearius has anti-malarial properties. Agaricus bisporus have anti-tumor and anti-bacterial properties. Despite tremendous scope for mushroom cultivation, the state has not been able to harness the potential. 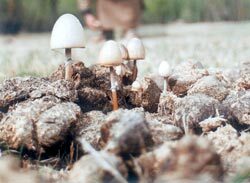 Though the agriculture department and rrl has started a programme to instil confidence among prospective farmers to cultivate species of mushrooms artificially, the sector has not picked up. "People in Kashmir have not explored mushroom cultivation to that level where we can say that we have made tremendous progress in this sector. Now we have started a massive programme to lure the farmers to this sector. We are providing them mushroom spawn and help them in growing white button mushrooms artificially, in controlled condition, in their homes. Our efforts have started showing positive effects," says Ghulam Hyder Bhat, director, department of agriculture, Kashmir. Official statistics released by the state's agriculture department reveal that the production of white button mushrooms during 2002-2003 was 25,800 kilograms in the valley, against the 20,600 kilograms produced in 2001-2002.
rrl scientists are now engaged in cultivating some species of wild mushrooms in controlled conditions. "Attempts are being made to raise the crops of Pleurotus ulmarious, Polyporus sp., Pleurotus ulmarios and Falmamulina velutipes on cut pieces of poplar trunk. The experiment is in progress," says Shawl. According to him, Pleurotus ulmarious is a widespread wild mushroom of the Kashmir valley that grows in abundance on dead stumps of trees. "This is an edible fungus and is regarded an excellent one for food. It has a high calorific value and is rich in protein. The mushroom was successfully grown on the substrate wheat straw fortified with two percent rice bran," Shawl adds.